Terrier head coach David Quinn has been named by USA Hockey to lead the U.S. Junior National Team in next year’s IIHF World Junior Championships. The tournament begins Dec. 26 at sites in Vancouver and Victoria, British Columbia. 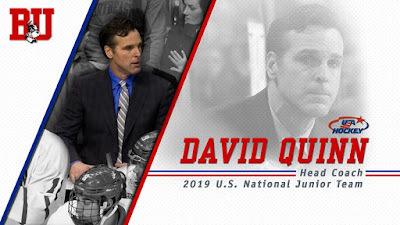 Quinn, who has completed five seasons behind the Terrier bench, had played on the first US team to medal in the WJCs in 1986 and was an assistant on the 2005 squad. He has served as an assistant on multiple US National teams and US Women’s National teams, as well as a US NTDP head coach for two seasons (2002-04). Quinn’s assistants for the tournament are Mike Hastings (Minnesota State), Dave Lassonde (Dartmouth) and Steve Miller (Ohio State). He’s the second BU coach to lead the US Junior National Team. Jack Parker held that post at the 1996 World Junior Championships. Former Terrier standout Ryan Whitney interviewed Quinn for NHL Network. 2018 recruit Joel Farabee scored his second goal in two games at the IIHF World U18 Championships in Russia. Farabee sniped a shot to the far top corner for Team USA’s fourth goal in an 8-5 win against Switzerland. 2018 recruit Jake Wise assisted on the goal. A third 2018 recruit, Tyler Weiss, scored a third-period goal for the U.S., which next plays Sweden on Sunday. 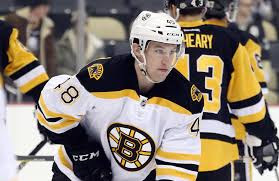 Former Terrier captain and All-American Matt Grzelcyk returned to the Bruins line-up in game four of its first-round series with Toronto, which Boston leads, 3-1. The Charlestown, Massachusetts native became a fixture on the Bruins' blueline since his call-up in late November, skating in 63 regular season games, generating 15 points and a +21 rating. Former Daily Free Press and Boston Globe hockey writer Fluto Shinzawa profiles Grzelcyk for "The Athletic" titled Mixing smarts and assertiveness, Matt Grzelcyk turned himself into an impact player. Nick Bonino scored Nashville's only goal in a 2-1 loss to Colorado, cutting the Predators' series lead to three games to two.